High-frequency focused ultrasound has emerged as a powerful modality for both biomedical imaging and elastography. It is gaining more attention due to its capability to outperform many other imaging modalities at a submicron resolution. Besides imaging, high-frequency ultrasound or acoustic biomicroscopy has been used in a wide range of applications to assess the elastic and mechanical properties at the tissue and single cell level. The interest in acoustic microscopy stems from the awareness of the relationship between biomechanical and the underlying biochemical processes in cells and the vast impact these interactions have on the onset and progression of disease. Furthermore, ultrasound biomicroscopy is characterized by its non-invasive and non-destructive approach. This, in turn, allows for spatiotemporal studies of dynamic processes without the employment of histochemistry that can compromise the integrity of the samples. Numerous techniques have been developed in the field of acoustic microscopy. This review paper discusses high-frequency ultrasound theory and applications for both imaging and elastography. Keywords: Focused Ultrasound (FUS), High-frequency Ultrasound (HIFU), Scanning Acoustic Microscopy (SAM), Cancer metastasis, Tumor microenvironment, Biomechanical properties, Elastography, Ultrasound biomicroscopy. © 2018 Anastasiadis and Zinin. Biomechanical factors play a crucial role in regulating cell physiology, including cell division, cell locomotion, and cell adhesion [1Fung YC. Biomechanics Mechanical Properties of Living Tissues 1993; 569.-4Evans EA, Skalak R. Mechanics and Thermodynamics of Biomembranes Florida 1980.]. There is an intricate relationship between single-cell biomechanics and the onset and progression of disease [2Bao G, Suresh S. Cell and molecular mechanics of biological materials. Nat Mater 2003; 2(11): 715-25. [http://dx.doi.org/10.1038/nmat1001] [PMID: 14593396] , 5Zhang G, Long M, Wu ZZ, Yu WQ. Mechanical properties of hepatocellular carcinoma cells. World J Gastroenterol 2002; 8(2): 243-6. [http://dx.doi.org/10.3748/wjg.v8.i2.243] [PMID: 11925600] -7Brunner C, Niendorf A, Kas JA. Passive and active single-cell biomechanics: A new perspective in cancer diagnosis. Soft Matter 2009; 5(11): 2171-8. [http://dx.doi.org/10.1039/b807545j] ]. During cancer metastasis, for example, cells undergo elastic deformations to intra- and extravasate through the endothelial lining of blood vessels toward the formation of secondary tumors [6Guck J, Schinkinger S, Lincoln B, et al. Optical deformability as an inherent cell marker for testing malignant transformation and metastatic competence. Biophys J 2005; 88(5): 3689-98. [http://dx.doi.org/10.1529/biophysj.104.045476] [PMID: 15722433] , 8Wirtz D, Konstantopoulos K, Searson PC. The physics of cancer: The role of physical interactions and mechanical forces in metastasis. Nat Rev Cancer 2011; 11(7): 512-22. [http://dx.doi.org/10.1038/nrc3080] [PMID: 21701513] -10Beil M, Micoulet A, von Wichert G, et al. Sphingosylphosphorylcholine regulates keratin network architecture and visco-elastic properties of human cancer cells. Nat Cell Biol 2003; 5(9): 803-11. [http://dx.doi.org/10.1038/ncb1037] [PMID: 12942086] ]. Despite significant advances in the field, the mechanical properties pertinent to deformation mechanisms of cancerous cells remain primarily elusive [5Zhang G, Long M, Wu ZZ, Yu WQ. Mechanical properties of hepatocellular carcinoma cells. World J Gastroenterol 2002; 8(2): 243-6. [http://dx.doi.org/10.3748/wjg.v8.i2.243] [PMID: 11925600] , 11Ward KA, Li WI, Zimmer S, Davis T. Viscoelastic properties of transformed cells: Role in tumor cell progression and metastasis formation. Biorheology 1991; 28(3-4): 301-13. [http://dx.doi.org/10.3233/BIR-1991-283-419] [PMID: 1932719] ]. Malignant cells typically respond as either less elastic (softer) or less viscous (less resistant to flow) to external stress exerted onto them from their immediate microenvironment [6Guck J, Schinkinger S, Lincoln B, et al. Optical deformability as an inherent cell marker for testing malignant transformation and metastatic competence. Biophys J 2005; 88(5): 3689-98. [http://dx.doi.org/10.1529/biophysj.104.045476] [PMID: 15722433] , 11Ward KA, Li WI, Zimmer S, Davis T. Viscoelastic properties of transformed cells: Role in tumor cell progression and metastasis formation. Biorheology 1991; 28(3-4): 301-13. [http://dx.doi.org/10.3233/BIR-1991-283-419] [PMID: 1932719] ]. Numerous techniques have been developed for studying the mechanical and elastic properties of cells and tissues [6Guck J, Schinkinger S, Lincoln B, et al. Optical deformability as an inherent cell marker for testing malignant transformation and metastatic competence. Biophys J 2005; 88(5): 3689-98. [http://dx.doi.org/10.1529/biophysj.104.045476] [PMID: 15722433] , 12Van Vliet KJ, Bao G, Suresh S. The biomechanics toolbox: Experimental approaches for living cells and biomolecules. Acta Mater 2003; 51(19): 5881-905. [http://dx.doi.org/10.1016/j.actamat.2003.09.001] ] including: (i) micropipette technique [4Evans EA, Skalak R. Mechanics and Thermodynamics of Biomembranes Florida 1980., 13Hochmuth RM, Worthy PR, Evans EA. Red cell extensional recovery and the determination of membrane viscosity. Biophys J 1979; 26(1): 101-14. [http://dx.doi.org/10.1016/S0006-3495(79)85238-8] [PMID: 262407] ]; (ii) magnetic twisting cytometry [14Crick FHC, Hughes AFW. The physical properties of the cytoplasm. A study by the means of the magnetic particle method. Exp Cell Res 1965; 1: 37-80. [http://dx.doi.org/10.1016/0014-4827(50)90048-6] , 15Puig-De-Morales M, Grabulosa M, Alcaraz J, et al. Measurement of cell microrheology by magnetic twisting cytometry with frequency domain demodulation. J Appl Physiol 2001; 91(3): 1152-9. [http://dx.doi.org/10.1152/jappl.2001.91.3.1152] [PMID: 11509510] ]; (iii) optical tweezers, laser tweezers or optical clamps [16Ashkin A, Dziedzic JM. Optical trapping and manipulation of viruses and bacteria. Science 1987; 235(4795): 1517-20. [http://dx.doi.org/10.1126/science.3547653] [PMID: 3547653] , 17Ananthakrishnan R, Guck J, Wottawah F, Schinkinger S, Lincoln B, Romeyke M, et al. Modelling the structural response of an eukaryotic cell in the optical stretcher. Curr Sci 2005; 88(9): 1434-40. ]; (iv) optical stretcher [18Guck J, Chiang JA, Kas J. The optical stretcher a novel tool to characterize the cytoskeleton Molecular Biology of the Cell 1998., 19Guck J, Ananthakrishnan R, Moon TJ, Cunningham CC, Kas J. Optical deformability of cells. Biophys J 2000; 78(1)], and (v) atomic force microscopy [20Radmacher M, Fritz M, Hansma PK. Imaging soft samples with the atomic force microscope: Gelatin in water and propanol. Biophys J 1995; 69(1): 264-70. [http://dx.doi.org/10.1016/S0006-3495(95)79897-6] [PMID: 7669903] , 21Faria EC, Ma N, Gazi E, et al. Measurement of elastic properties of prostate cancer cells using AFM. Analyst (Lond) 2008; 133(11): 1498-500. [http://dx.doi.org/10.1039/b803355b] [PMID: 18936825] ]. The primary challenge in measuring viscoelastic properties not only of cancer cells but of any other cell type lies in the fact that physiological conditions resembling their native environment should be maintained. In general, viscoelastic cell properties are dependent on external stimuli [22Lim CT, Zhou EH, Quek ST. Mechanical models for living cells--A review. J Biomech 2006; 39(2): 195-216. [http://dx.doi.org/10.1016/j.jbiomech.2004.12.008] [PMID: 16321622] , 23Palmer A, Xu J, Kuo SC, Wirtz D, Wirtz D. Diffusing wave spectroscopy microrheology of actin filament networks. Biophys J 1999; 76(2): 1063-71. [http://dx.doi.org/10.1016/S0006-3495(99)77271-1] [PMID: 9916038] ]. Scanning Acoustic Microscopy (SAM) is a robust approach for the study of viscoelastic properties of biological tissues and single cells [24Bereiter-Hahn J, Blase C. Ultrasonic Characterization of Biological Cells.Ultrasonic Nondestructive Evaluation: Engineering and Biological Material Characterization 2003; 725-59. [http://dx.doi.org/10.1201/9780203501962.ch12] , 25Wang J, Gundle R, Briggs GAD. The measurement of acoustic properties of living human cells. Trans R Microsc Soc 1990; 1: 91-4.]. Employing very short focused ultrasound pulses allows for the simultaneous determination of cell thickness, sound velocity, viscoelasticity, and density [26Briggs A. Acoustic Microscopy 1992.-28Jørgensen CS, Assentoft JE, Knauss D, Gregersen H, Briggs GAD. Small intestine wall distribution of elastic stiffness measured with 500 MHz scanning acoustic microscopy. Ann Biomed Eng 2001; 29(12): 1059-63. [http://dx.doi.org/10.1114/1.1424920] [PMID: 11853256] ]. One of the main advantages in applying SAM to viable cells is the fact that no prior preparation of the samples is necessary [24Bereiter-Hahn J, Blase C. Ultrasonic Characterization of Biological Cells.Ultrasonic Nondestructive Evaluation: Engineering and Biological Material Characterization 2003; 725-59. [http://dx.doi.org/10.1201/9780203501962.ch12] , 29Briggs GAD, Wang J, Gundle R. Quantitative acoustic microscopy of individual living human cells. J Microsc 1993; 172(Pt 1): 3-12. [http://dx.doi.org/10.1111/j.1365-2818.1993.tb03387.x] [PMID: 8289225] , 30Bereiter-Hahn J, Karl I, Lüers H, Vöth M. Mechanical basis of cell shape: Investigations with the scanning acoustic microscope. Biochem Cell Biol 1995; 73(7-8): 337-48. [http://dx.doi.org/10.1139/o95-042] [PMID: 8703407] ]. This review paper describes Time-Resolved SAM (TRSAM) for both image formation using high-frequency focused ultrasound and the acoustic characterization of biomechanical properties. The theory of SAM will be discussed in further detail. Finally, applications of ultrasound biomicroscopy and elastography will be presented with a focus on cancer biology. Various SAM techniques have been developed for the mechanoelastic quantification of biological materials on a microscopic cell and tissue level [24Bereiter-Hahn J, Blase C. Ultrasonic Characterization of Biological Cells.Ultrasonic Nondestructive Evaluation: Engineering and Biological Material Characterization 2003; 725-59. [http://dx.doi.org/10.1201/9780203501962.ch12] , 31Zinin PV, Weise W. Theory and Applications of Acoustic Microscopy.Ultrasonic Nondestructive Evaluation: Engineering and Biological Material Characterization 2004; 654-724.]. Detailed descriptions of the fundamental principles of acoustic microscopy have been described elsewhere [26Briggs A. Acoustic Microscopy 1992., 31Zinin PV, Weise W. Theory and Applications of Acoustic Microscopy.Ultrasonic Nondestructive Evaluation: Engineering and Biological Material Characterization 2004; 654-724.]. In brief, an acoustic pulse is directed and focused onto the specimen through a sapphire lens (Fig. 1 ). The lens contains a piezoelectric transducer at one end while its opposite side is mounted on a spherical or cylindrical cavity coated with a quarter wavelength of a matching layer [32Zinin PV. Quantitative acoustic microscopy.Experimental Methods in the Physical Sciences 39 2001; 135-87.]. The same lens transmits acoustic pulses and receives the reflected echoes; this is achieved by using a fast electronic switch alternating between the two modes. A liquid, usually a buffered medium (e.g., cell culture medium, phosphate buffer) couples the acoustic lens with the sample. Echo signals resolved in the time domain. The echo signal originating from the sample’s surface arrives at t1 and has an amplitude of A1 while the echo that is reflected from the interface between the sample and its substrate is received at time point t2 with a corresponding amplitude of A2. From the arrival time of each maximum and their respective amplitudes, the elastic and mechanical parameters of the specimen can be deduced. In one study, acoustic images obtained from chicken heart fibroblasts, recorded at a frequency of 1.5 GHz, revealed protruding bands along the cell margin [33Hildebrand JA. Observation of cell-substrate attachment with the acoustic microscope. IEEE Trans Sonics Ultrason 1985; 32(2): 332-40. [http://dx.doi.org/10.1109/T-SU.1985.31600] , 34Hildebrand JA, Rugar D, Johnston RN, Quate CF. Acoustic microscopy of living cells. Proceedings of the National Academy of Sciences of the United States of America 1981; 1656-60.]. Furthermore, it was shown that acoustic images of fibroblasts contained interference fringes similar to Newton rings, which are generated when light is reflected between two surfaces – a spherical surface and an adjacent flat surface. Assuming that the density remains constant, the position and intensities of the rings can be translated into the respective attenuation coefficient, ultrasound velocity, and cell thickness [35Litniewski J, Bereiter-Hahn J. Measurements of cells in culture by scanning acoustic microscopy. J Microsc 1990; 158(Pt 1): 95-107. [http://dx.doi.org/10.1111/j.1365-2818.1990.tb02981.x] [PMID: 2352274] ]. One main limitation of the so-called Newton ring technique for the acoustic characterization of cells is that interference fringes can only be used for the peripheral area of a cell because the central region lacks fringes. In addition, the order of interference must be known [35Litniewski J, Bereiter-Hahn J. Measurements of cells in culture by scanning acoustic microscopy. J Microsc 1990; 158(Pt 1): 95-107. [http://dx.doi.org/10.1111/j.1365-2818.1990.tb02981.x] [PMID: 2352274] ]. Errors in the thickness estimation will ultimately translate into errors in the calculation of the respective acoustic attenuation and impedance [36Kundu T, Bereiter-Hahn J, Hillmann K. Measuring elastic properties of cells by evaluation of scanning acoustic microscopy V(Z) values using simplex algorithm. Biophys J 1991; 59(6): 1194-207. [http://dx.doi.org/10.1016/S0006-3495(91)82335-9] [PMID: 19431793] ]. In order to determine variations in thickness, density, acoustic wave velocity, stiffness, and the attenuation coefficient of viable or apoptotic cells by SAM, Kundu et al. proposed to use the V(z) technique, that measured voltage (V) versus the defocus distance (z) curve [36Kundu T, Bereiter-Hahn J, Hillmann K. Measuring elastic properties of cells by evaluation of scanning acoustic microscopy V(Z) values using simplex algorithm. Biophys J 1991; 59(6): 1194-207. [http://dx.doi.org/10.1016/S0006-3495(91)82335-9] [PMID: 19431793] ]. However, because V(z) curves are only generated when cells remain attached to solid substrates, Rayleigh waves are formed at the angles of incidence. This approach also requires that the surface waves must not be severely attenuated [37Kundu T, Bereiter-Hahn J, Karl I. Cell property determination from the acoustic microscope generated voltage versus frequency curves. Biophys J 2000; 78(5): 2270-9. [http://dx.doi.org/10.1016/S0006-3495(00)76773-7] [PMID: 10777725] ]. Due to these limitations, Kundu et al. suggested an alternative technique using V(f) curves [37Kundu T, Bereiter-Hahn J, Karl I. Cell property determination from the acoustic microscope generated voltage versus frequency curves. Biophys J 2000; 78(5): 2270-9. [http://dx.doi.org/10.1016/S0006-3495(00)76773-7] [PMID: 10777725] ]. The V(f) approach measures the voltage (V) versus the frequency of sound (f) at a fixed defocus z. One distinctive feature of V(f) curves is that the surface-skimming Rayleigh waves are not generated within the specimen when the acoustic lens is positioned at the focal distance. On the other hand, longitudinal wave speed and attenuation variations within a cell can be predicted using this method [37Kundu T, Bereiter-Hahn J, Karl I. Cell property determination from the acoustic microscope generated voltage versus frequency curves. Biophys J 2000; 78(5): 2270-9. [http://dx.doi.org/10.1016/S0006-3495(00)76773-7] [PMID: 10777725] ]. One weakness of the V(f) curve approach is that several parameters (e.g., cell thickness, sound velocity, attenuation) have to be determined from the non-linear curve fitting. In contrast to the V(z) and V(f) SAM techniques, the time-resolved approach does not require any of the biomechanical properties of the specimen under investigation to be already known [26Briggs A. Acoustic Microscopy 1992., 27Briggs GAD, Wang J, Gundle R. Quantitative acoustic microscopy of individual living human cells. J Microsc 1993; 172(Pt 1): 3-12. [http://dx.doi.org/10.1111/j.1365-2818.1993.tb03387.x] [PMID: 8289225] , 31Zinin PV, Weise W. Theory and Applications of Acoustic Microscopy.Ultrasonic Nondestructive Evaluation: Engineering and Biological Material Characterization 2004; 654-724., 38Atalar A, Hoppe M. High-performance acoustic microscope. Rev Sci Instrum 1986; 57(10): 2568-76. [http://dx.doi.org/10.1063/1.1139061] , 39Briggs A. An Introduction to Scanning Acoustic Microscopy 1985.]. TRSAM since this acronym has already been introduced in the previous section allows for the determination of the mechanoelastic properties of tissues and individual cells by using highly focused acoustic pulses that are sufficiently short so that reflections from the sample’s surface can be separated from the ones arriving from the interface between the sample and its substrate [27Briggs GAD, Wang J, Gundle R. Quantitative acoustic microscopy of individual living human cells. J Microsc 1993; 172(Pt 1): 3-12. [http://dx.doi.org/10.1111/j.1365-2818.1993.tb03387.x] [PMID: 8289225] ]. The time-of-flight technique was applied in acoustic microscopy nearly thirty years ago [40Yamanaka K. Surface acoustic wave measurement using an impulse converging beam. J Appl Phys 1983; 54: 4323-9. [http://dx.doi.org/10.1063/1.332667] ] to measure the velocity of surface acoustic waves (SAWs) as an alternative to the V(z) curve method. Although its accuracy was estimated to be lower compared to the V(z) curve technique, it permitted measuring the speed of SAWs confined within a small area. Later, a group from Oxford University made an essential contribution to the application of a time-resolving method for layered materials [41Knaus D, Zhai T, Briggs GAD, Martin JM. Measuring short cracks by time-resolved acoustic microscopy.Advances in Acoustic Microscopy I 1995; 49-77. [http://dx.doi.org/10.1007/978-1-4615-1873-0_2] -45Daft CMW, Briggs GAD, O’Brien WD Jr. Frequency dependence of tissue attenuation measured by acoustic microscopy. J Acoust Soc Am 1989; 85(5): 2194-201. [http://dx.doi.org/10.1121/1.397868] [PMID: 2732391] ]. The first measurements of elastic properties of biological tissues at ultra-high frequencies (1.2 GHz) were published by Kanngiesser and Anliker [46Kanngiesser H, Anliker M. Ultrasound microscopy of biological structures with weak reflecting properties.Acoustical Imaging 19 1992; 517-22. [http://dx.doi.org/10.1007/978-1-4615-3370-2_81] ]. However, the first results on the elastic properties of single cells by TRSAM were reported by Briggs et al. [27Briggs GAD, Wang J, Gundle R. Quantitative acoustic microscopy of individual living human cells. J Microsc 1993; 172(Pt 1): 3-12. [http://dx.doi.org/10.1111/j.1365-2818.1993.tb03387.x] [PMID: 8289225] ]. 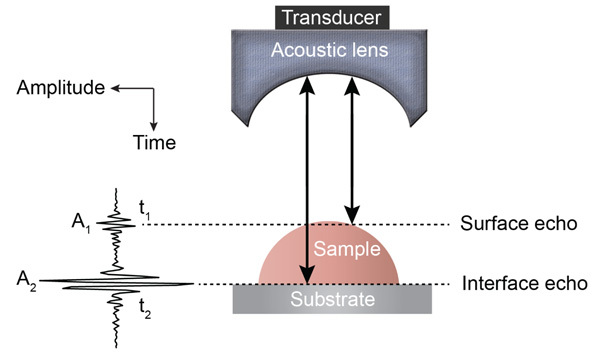 In TRSAM, the acoustic parameters of biological cell and tissue samples are derived from the arrival time and the amplitude of the reflected echoes. Fig. (1 ) shows a typical signal received during the investigation of a sample; two characteristic maxima can be distinguished, A1 and A2, originating from the surface of the investigated specimen and the interface between the specimen and its substrate, respectively. The amplitude of the echoes (A1 and A2) and their respective arrival times (t1 and t2) form the basis for the estimation of local mechanical and elastic properties [26Briggs A. Acoustic Microscopy 1992., 47Weiss EC, Anastasiadis P, Pilarczyk G, Lemor RM, Zinin PV. Mechanical properties of single cells by high-frequency time-resolved acoustic microscopy. IEEE Trans Ultrason Ferroelectr Freq Control 2007; 54(11): 2257-71. [http://dx.doi.org/10.1109/TUFFC.2007.530] [PMID: 18051160] ]. The magnitude of the reference signal (A0 ) is reflected from the same substrate material but without any interfering sample along the beam path between the lens and the substrate. The positions and values of the maxima of the echo signals reflected from the surface and the sample/substrate interface can be obtained by using the Hilbert transform H(s) [48Lempriere BM. Ultrasound and Elastic waves Frequently Asked Questions Amsterdam 2002. ], which is described in detail elsewhere [47Weiss EC, Anastasiadis P, Pilarczyk G, Lemor RM, Zinin PV. Mechanical properties of single cells by high-frequency time-resolved acoustic microscopy. IEEE Trans Ultrason Ferroelectr Freq Control 2007; 54(11): 2257-71. [http://dx.doi.org/10.1109/TUFFC.2007.530] [PMID: 18051160] ]. The ultrasound velocity of the coupling medium (e.g., cell culture medium, phosphate buffer solution) can be calculated based on the empirical formula given by Greenspan and Tschiegg [49Greenspan M, Tschiegg CE. Tables of the speed of sound in water. J Acoust Soc Am 1959; 31(1): 75-6. [http://dx.doi.org/10.1121/1.1907614] ] on the assumption that the viscoelastic properties of these media are close to the ones of distilled water at given temperatures. Therefore, the local density of cells or tissue sections can be obtained using the expression for the ultrasonic velocity and the acoustic impedance given by Eqs. (7) and (8). where Zs is the acoustic impedance of the substrate. The above analysis, yielding the local biomechanical properties, requires that the echo signals be adequately separated from one another in the time domain. However, if the signals cannot be resolved in the time domain then they can be alternatively expressed in the frequency domain by applying the Fourier transform [26Briggs A. Acoustic Microscopy 1992.]. From the frequency dependence of A2(f), the frequency dependence of the attenuation can be obtained directly from Eq. (9). where, V0 is the signal emitted by the acoustic lens and reflected from a perfectly reflecting surface with P(θW)=1, located on the focal plane (z = 0); α is the semi-aperture angle of the lens, ; cw is the wavenumber in the coupling liquid; z is the defocusing distance; P(θW) is the pupil function of the lens [53Weise W, Zinin P, Briggs A, Wilson T, Boseck S. Examination of the two-dimensional pupil function in coherent scanning microscopes using spherical particles. J Acoust Soc Am 1998; 104(1): 181-91. [http://dx.doi.org/10.1121/1.423268] [PMID: 9670522] ]; and R(θW, ω) is the reflection coefficient. V(z, ω) is frequency-independent for a solid half-space, but its behavior depends on the frequency for layered media. The normalizing coefficient is important when simulating the signal from a sub-surface defect. The sign in the exponent indicates the direction on the z-axis. By convention, the z-axis is directed toward the lens so that any defocusing toward the object, corresponds to a negative value of z. The shape of s0 (t) of the microscope can be calculated using the following assumptions: (i) the signal reflected from a perfect reflector when the acoustic lens remains in focus is frequency-independent; (ii) the surface of a perfect reflector does not influence the spectrum of the incident beam and, (iii) the echo signal is proportional to s0 (t) for the case when the acoustic lens is in focus [32Zinin PV. Quantitative acoustic microscopy.Experimental Methods in the Physical Sciences 39 2001; 135-87.]. The model uses S0 (ω, z) as measured experimentally for echo signals reflected from a perfect reflector when the lens is in focus. Previous studies have shown that the signal from the glass is a good approximation for s0 (t) when the surface of the glass coincides with the focus of the lens [50Zinin PV, Weise W. Theory and applications of acoustic microscopy.Ultrasonic Nondestructive Evaluation: Engineering and Biological Material Characterization 2003; 654-724.]. Bogy and Gracewski obtained an analytical expression of the reflection coefficient for a one-layer system, which can be used for the simulation of V(ω, z) [54Bogy DB, Gracewski SM. On the plane-wave reflection coefficient and nonspecular reflection of bounded beams for layered half-spaced uderwater. J Acoust Soc Am 1983; 74(2): 591-9. [http://dx.doi.org/10.1121/1.389827] -56Bogy DB, Gracewski SM. Nonspecular reflection of bounded acoustic beams from solid-liquid interface of two elastic layers on a half-space under water. Int J Solids Struct 1984; 20(8): 747-60. [http://dx.doi.org/10.1016/0020-7683(84)90063-5] ]. In SAM, the curve V(ω, z) is often called V(f) [37Kundu T, Bereiter-Hahn J, Karl I. Cell property determination from the acoustic microscope generated voltage versus frequency curves. Biophys J 2000; 78(5): 2270-9. [http://dx.doi.org/10.1016/S0006-3495(00)76773-7] [PMID: 10777725] , 57Nagy PB, Adler L. Acoustic material signature from frequency analysis. J Appl Phys 1990; 67(8): 3876-8. 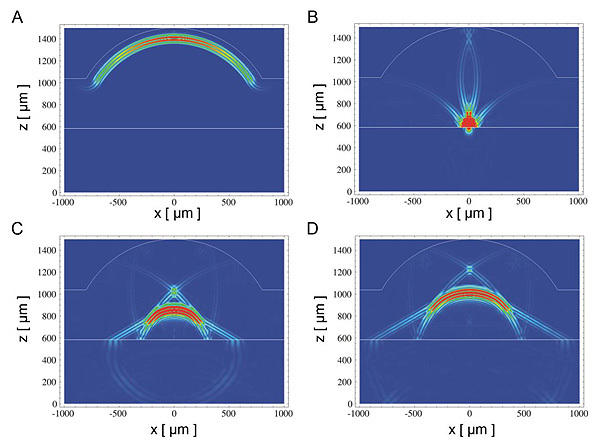 [http://dx.doi.org/10.1063/1.344987] , 58Ghosh T, Maslov KI, Kundu T. A new method for measuring surface acoustic wave speeds by acoustic microscopes and its application in characterizing laterally inhomogeneous materials. Ultrasonics 1997; 35(5): 357-66. [http://dx.doi.org/10.1016/S0041-624X(97)00012-7] ]. It is difficult to obtain an analytical expression for the integral in Eq. (14). However, computational methods allow for the numerical modeling of the propagating short acoustic pulses in TRSAM [59Zhang J, Baboux JC, Guy P. PVDF large aperture spherical transducer in the transient mode. In: McAvoy BR, Levy M, Scheider SC, Eds. Proceedings of IEEE 1994 Ultrasonic Symposium 31994; : 517-20. [http://dx.doi.org/10.1109/ULTSYM.1994.401641] , 60Zhang J, Guy P, Baboux JC, Jayet Y. Theoretical and experimental responses for a large-aperture broadband spherical transducer probing a liquid-solid boundary. J Appl Phys 1999; 86(5): 2825-35. [http://dx.doi.org/10.1063/1.371131] ]. Schubert et al. reported the numerical simulation of the acoustic pulse propagation and reflection of the focusing incident waves for different types of scatterers using the elasto-dynamic finite integration technique (EFIT) [61Schubert F, Koehler B, Zinin P. Numerical time-domain simulation of wave propagation and scattering in acoustic microscopy for subsurface defect characterization 2005.]. In this simulation, the acoustic lens was modeled as a spherical focusing transducer with a half-aperture angle of 60°. The focal length was set at 924 μm emitting a transient (two-cycle raised cosine) pulse at a center frequency of 25 MHz [62Schubert F, Koehler B, Zinin P, Eds. Numerical time-domain simulation of wave propagation and scattering in acoustic microscopy for subsurface defect characterization Nondestructive Evaluation for Health Monitoring and Diagnostics 2005.]. A water layer was used as the coupling medium (cw = 1500 m/s, ρ = 1000 kg/m3) between the transducer and the boundary fluid. Fig. (2 ) depicts the results of the simulations for the propagation of short pulses generated by a spherical transducer (Fig. 2A ). The reflection of a pulse from a water/steel interface is shown in Fig. (2B and C ). Finally, Fig. (2D ) shows the propagation of the reflected pulse back to the transducer. The boundary of the half-space is located at the geometrical focal point of the transducer (Fig. 2 ). If the substrate is an elastic solid (e.g., metal or ceramic), different types of waves can be generated at the water and solid interface. Fig. (2 ) also demonstrates the generation of shear and longitudinal waves inside a Zn substrate, as well as the generation of Leaky Rayleigh Waves (LRW) and radiation of LRW [62Schubert F, Koehler B, Zinin P, Eds. Numerical time-domain simulation of wave propagation and scattering in acoustic microscopy for subsurface defect characterization Nondestructive Evaluation for Health Monitoring and Diagnostics 2005.]. Numerical Cylindrical Elastodynamic Finite Integration Technique (CEFIT): Simulation of the acoustic wave field in reflection SAM at an idealized water/steel interface lying at the geometrical focal point of the transducer. The temporal snapshots display the absolute value of the particle velocity vector using a linear grayscale: (A) wavefront after radiating from transducer; (B) wavefront approaching the solid/liquid interface; (C) reflection of the wavefront form solid/liquid interface; (D) wavefront travelling back to the transducer after reflection from the interface. The center frequency of the input pulse is 25 MHz. The half-aperture angle of the transducer amounts to 60°, and its focal length is 924 μm. The temporal snapshots display the absolute value of particle velocity using a linear grayscale (images are courtesy of Frank Schubert, Fraunhofer IKTS, Dresden, Germany). These simulations reveal that the incident wavefront has a nearly spherical shape while the reflected wavefront has a more complicated shape suggesting that it is more suitable to use a geometrical optics approach. Such an approach is based on the fact that the main contribution to the signal is made by reflected rays that strike the surface of the transducer normally or rays that intersect the focal point [63Stamnes JJ. Waves in Focal Region. Adam Hilger 1986.-65Zinin P, Weise W, Lobkis O, Kolosov O, Boseck S. Fourier optics analysis of spherical-particles image-formation in reflection acoustic microscopy. Optik (Stuttg) 1994; 98(2): 45-60.]. If the inclination of the substrate plane is relatively small, then only rays normal to the substrate should be taken into account for the signal simulations. High-frequency TRSAM can image biological specimens at a sub-micrometer resolution. Acoustic images are generated from a fixed number of pixels assigned specific greyscale values and coordinates on the image plane (xi, yi), and arranged as a grid. The coordinates (xi, yi) determine the position of each pixel on the grid. where, N is the total number of recordings taken at (xi, yi) and Δt is the time gate that covers the delay between the arrival times of the surface and interface echoes. Due to the integration of the signal, sn(xi, yi, z, t), the generated high-frequency acoustic images do not contain any interference fringes characteristic to monochromatic acoustic images [24Bereiter-Hahn J, Blase C. Ultrasonic Characterization of Biological Cells.Ultrasonic Nondestructive Evaluation: Engineering and Biological Material Characterization 2003; 725-59. [http://dx.doi.org/10.1201/9780203501962.ch12] ]. As a consequence, the RF signals contain not only the information necessary for image generation but also intrinsically the information necessary to deduce the elastic and mechanical properties of the sample [31Zinin PV, Weise W. Theory and Applications of Acoustic Microscopy.Ultrasonic Nondestructive Evaluation: Engineering and Biological Material Characterization 2004; 654-724.]. Fig. (3 ) shows C-scan images recorded from HeLa cells. A tenfold averaging of the signals was used to increase the signal-to-noise ratio on these images [47Weiss EC, Anastasiadis P, Pilarczyk G, Lemor RM, Zinin PV. Mechanical properties of single cells by high-frequency time-resolved acoustic microscopy. IEEE Trans Ultrason Ferroelectr Freq Control 2007; 54(11): 2257-71. [http://dx.doi.org/10.1109/TUFFC.2007.530] [PMID: 18051160] ]. Acoustic and optical images of HeLa cells: (A) C-scan was taken in focus at z = 0; (B) C-scan of the same cells taken in focus 10 min after “A”; (C) acoustic image taken at defocus (z = 5 µm) (micrometers) 6 min after “A”; (D) brightfield micrograph taken prior the acoustic acquisition. The field of view of the acoustic images was 50×50 um. Magnification of the optical image was 40× (Figure from Weiss, Anastasiadis et al. © 2007 IEEE). Furthermore, TRSAM allows for the spatiotemporal investigation of dynamic cellular processes, such as the study of focal adhesions. Focal adhesions allow cells to sense and respond to cues in their immediate microenvironment. These protein complexes depend strongly on the interactions between the actin cytoskeleton and integrins [66Weiss EC, Lemor RM, Pilarczyk G, Anastasiadis P, Zinin PV. Imaging of focal contacts of chicken heart muscle cells by high-frequency acoustic microscopy. Ultrasound Med Biol 2007; 33(8): 1320-6. [http://dx.doi.org/10.1016/j.ultrasmedbio.2007.01.016] [PMID: 17561332] -70Parsons JT, Horwitz AR, Schwartz MA. Cell adhesion: integrating cytoskeletal dynamics and cellular tension. Nat Rev Mol Cell Biol 2010; 11(9): 633-43. [http://dx.doi.org/10.1038/nrm2957] [PMID: 20729930] ]. In a reported study, the adhesion of embryonic chicken heart muscle cells was investigated by TRSAM [71Weiss EC, Lemor RM, Pilarczyk G, Anastasiadis P, Zinin PV. Imaging of focal contacts of chicken heart muscle cells by high-frequency acoustic microscopy. Ultrasound Med Biol 2007; 33(8): 1320-6. [http://dx.doi.org/10.1016/j.ultrasmedbio.2007.01.016] [PMID: 17561332] ]. Embryonic chicken heart muscle cells were imaged using brightfield and TRSAM at a center frequency of 860 MHz with a -6 dB bandwidth of 30% [71Weiss EC, Lemor RM, Pilarczyk G, Anastasiadis P, Zinin PV. Imaging of focal contacts of chicken heart muscle cells by high-frequency acoustic microscopy. Ultrasound Med Biol 2007; 33(8): 1320-6. [http://dx.doi.org/10.1016/j.ultrasmedbio.2007.01.016] [PMID: 17561332] ]. Fig. (4A ) demonstrates the advantage of using combined optical and acoustic microscopy concurrently. The contrast in the acoustic images represents the variation of the acoustic impedance and sound attenuation inside the cell [24Bereiter-Hahn J, Blase C. Ultrasonic Characterization of Biological Cells.Ultrasonic Nondestructive Evaluation: Engineering and Biological Material Characterization 2003; 725-59. [http://dx.doi.org/10.1201/9780203501962.ch12] , 31Zinin PV, Weise W. Theory and Applications of Acoustic Microscopy.Ultrasonic Nondestructive Evaluation: Engineering and Biological Material Characterization 2004; 654-724.]. The acoustic images of the embryonic chicken heart muscle cells revealed three distinct areas; the structure that can be clearly identified is the cell nucleus (Fig. 4B and C ). Outside the nucleus, in the cytoplasm, numerous small circular shaped organelles can be observed (Fig. 4B and C ) that may be liposomes and lipid granules [34Hildebrand JA, Rugar D, Johnston RN, Quate CF. Acoustic microscopy of living cells. Proceedings of the National Academy of Sciences of the United States of America 1981; 1656-60.]. The appearance of the cell periphery is different compared to the one of the nucleus and the cytoplasm surrounding the nucleus (Fig. 4C ). 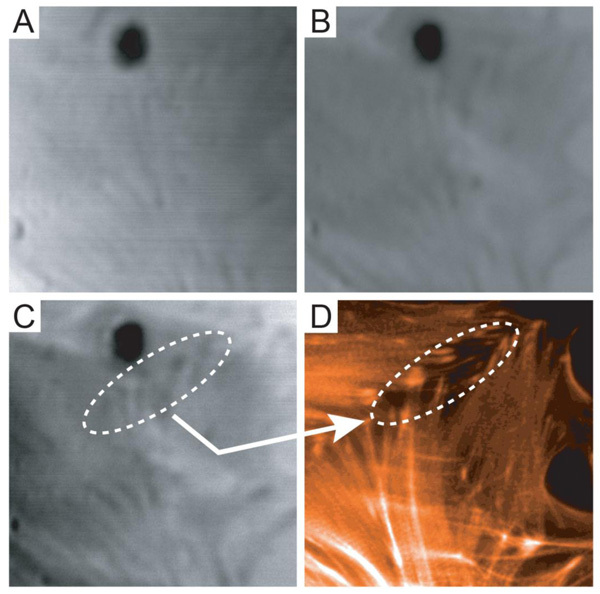 Optical and acoustic images of embryonic chicken heart muscle cells: (A) Fluorescence micrograph of an embryonic chicken heart muscle; (B) acoustic acquisition using TRSAM at a center frequency of 860 MHz in focus (z = 0). The optical image from “A” and the acoustic acquisition are shown as a 100% opaque overlay; (C) acoustic image overlaid on the fluorescence micrograph with opacity reduced to 70%. The field of view for the acoustic acquisition was 65×65 μm (Figure from Weiss, Lemor et al. © 2007 Ultrasound in Med. & Biol.). C-scans, B-scan, and intensity of a HeLa cell: (A) acoustic image (intensity) obtained at z = 0; (B) single frequency (900 MHz) acoustic image of the same cell at z = 0; (C) B-Scan of the cell from panel “A” across the indicated dashed line; The duration of the timeline is 140 ns and the values for the ultrasound speed range from 1433 m/s to 1621 m/s; (D) intensity of the surface echo. The scale bars in all panels correspond to 10 µm (Figure from Weiss, Anastasiadis et al. © 2007 IEEE). Besides image formation, TRSAM is capable of quantitative analysis of sound velocity and sound attenuation in cells [72Zinin PV. Quantitative Acoustic Microscopy.Modern Acoustical Techniques for the Measurement of Mechanical Properties Experimental Methods in the Physical Sciences 39 2001; 135-87., 73Anastasiadis P, Mojica KD, Allen JS, Matter ML. Detection and quantification of bacterial biofilms combining high-frequency acoustic microscopy and targeted lipid microparticles. J Nanobiotechnology 2014; 12: 24. [http://dx.doi.org/10.1186/1477-3155-12-24] [PMID: 24997588] ]. During RF data acquisition, the defocus z remains fixed while the RF signals at each pixel position are recorded. This, in turn, allows for the reconstruction of B- and C-scans [47Weiss EC, Anastasiadis P, Pilarczyk G, Lemor RM, Zinin PV. Mechanical properties of single cells by high-frequency time-resolved acoustic microscopy. IEEE Trans Ultrason Ferroelectr Freq Control 2007; 54(11): 2257-71. [http://dx.doi.org/10.1109/TUFFC.2007.530] [PMID: 18051160] ]. The B-scan represents the collection of RF signals when the lens mechanically scans the sample at a fixed defocus z along a single line [31Zinin PV, Weise W. Theory and Applications of Acoustic Microscopy.Ultrasonic Nondestructive Evaluation: Engineering and Biological Material Characterization 2004; 654-724., 74Zinin PV, Manghnani MH, Newtson C, Livingston RA. Acoustic microscopy imaging of steel reinforcement in concrete. Journal of Nondestructive Evaluation 2002; 21(4): 105-10. [http://dx.doi.org/10.1023/A:1023836400675] ]. Fig. (5A ) shows an intensity image of a viable HeLa cell. The intensity values at each point of the image were obtained using Eq. (16). However, the acoustic image in Fig. (5B ) was obtained using a different approach. This image is a single-frequency image and was obtained by choosing the amplitude of the Fourier transform at the central frequency |S(f) = 860 MHz, xi, yi, z)|, where |S| is the amplitude of the Fourier transform of the RF signals: S = F(s(t, xi, yi, z)) measured at each pixel position. The similarity between the intensity- and the single-frequency images is intriguing. Fig. (5C ) is a B-scan derived from the RF signals of the same HeLa cell. The horizontal axis reflects the direction of the B-scan (x is changed while y is kept fixed y = yB). The vertical axis corresponds to the arrival time of individual echoes reflected from the sample back to the transducer. A cross-section of the cell along individual scan lines can be generated by taking the average of the positive part of the RF signals. The intensity of the surface echo is shown in Fig. (5D ). As previously discussed, high-frequency TRSAM is particularly useful when it is required to determine mechanical and acoustic parameters of normal or abnormal cells. TRSAM allows for the observation of spatiotemporal changes of cellular processes under physiological conditions. Considering that mammalian cells are highly complex structures continually adapting to their microenvironment, the task of determining their biomechanical properties is consequently non-trivial. The many different techniques that have been developed for studying mechanoelastic properties of single cells or tissues contribute each to the collective understanding of cell biomechanics. However, most of these techniques are invasive to various levels and can potentially introduce artifacts due to handling and processing of the specimen. For example, contact by itself may alter cellular responses as it has been established that cells react to mechanical stimuli from their surrounding environment [75Ingber DE. Cellular mechanotransduction: putting all the pieces together again. FASEB J 2006; 20(7): 811-27. [http://dx.doi.org/10.1096/fj.05-5424rev] [PMID: 16675838] ]. 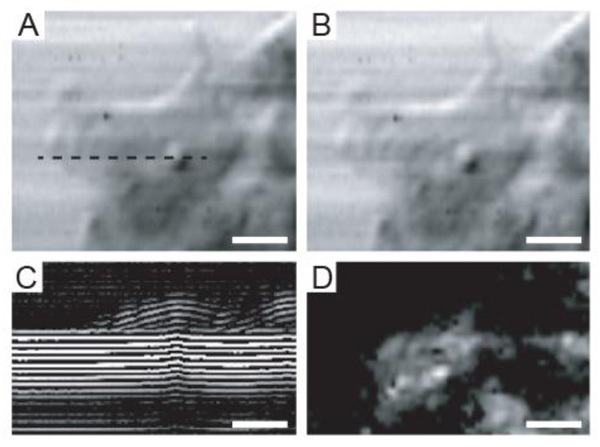 SAM is among very few techniques that allow for the determination of microstructural properties non-invasively [76Hofmann M, Pflanzer R, Habib A, et al. Scanning acoustic microscopy-A novel noninvasive method to determine tumor interstitial fluid pressure in a xenograft tumor model. Transl Oncol 2016; 9(3): 179-83. [http://dx.doi.org/10.1016/j.tranon.2016.03.009] [PMID: 27267834] , 77Sajio Y. Clinical Applications of Ultrasonic Nondestructive Evaluation.Ultrasonic Nondestructive Evaluation: Engineering and Biological Material Characterization 2004; 783-812.]. High-frequency ultrasound studies in the range between 20 MHz and 60 MHz led to the detection of backscatter from single cells. Strohm et al. described an increase of the backscatter intensity for cancerous cells treated with chemotherapeutic agents causing malignant cells to undergo apoptosis [78Strohm E, Czarnota GJ, Kolios MC. Quantitative measurements of apoptotic cell properties using acoustic microscopy. IEEE Trans Ultrason Ferroelectr Freq Control 2010; 57(10): 2293-304. [http://dx.doi.org/10.1109/TUFFC.2010.1690] [PMID: 20889417] ]. The need to achieve higher resolution and the inability of ultrasound in the range between 20 and 60 MHz to detect the exact sources of backscatter variations, led to the use of ultra-high frequency SAM (e.g., 500 MHz) for the determination of elastic properties of fibroblastic cells whose thickness did not exceed 5 µm [29Briggs GAD, Wang J, Gundle R. Quantitative acoustic microscopy of individual living human cells. J Microsc 1993; 172(Pt 1): 3-12. [http://dx.doi.org/10.1111/j.1365-2818.1993.tb03387.x] [PMID: 8289225] ]. However, even at these ultra-high frequencies, the wavelength of the sound waves was not sufficiently small to resolve internal cell structures. Consequently, higher frequencies in the range between 800 MHz and 1 GHz have been applied in order to discern the acoustic properties of biological specimens at the cell level with a near-optical resolution at a sub-micrometer scale. Local sound velocity studies have been previously carried out using the time-resolved approach in conjunction with the tone-burst deconvolution technique. In these studies, the sound velocity for human aortic smooth muscle cells under growing, differential, and hypotonic loading conditions was found to be 1571 m/s ± 14 m/s, 1624 m/s ± 16 m/s and 1585 m/s ± 8 m/s, respectively. Similarly, SAM studies of normal coronary artery sections yielded comparable sound velocities of 1560 m/s ± 18 m/s in the medium layer between the intima and adventitia [79Saijo Y, Santos Filho E, Sasaki H, et al. Ultrasonic tissue characterization of atherosclerosis by a speed-of-sound microscanning system. IEEE Trans Ultrason Ferroelectr Freq Control 2007; 54(8): 1571-7. [http://dx.doi.org/10.1109/TUFFC.2007.427] [PMID: 17703660] ]. Cancerous cells differ from normal healthy cells in that they proliferate uncontrollably. Defects in their cell-cycle checkpoints result in the absence of the critical cell control mechanisms that initiate apoptosis, the cell’s programmed death. There is a direct link between the malignant transformation of a healthy cell and its inability to induce apoptosis [80Kastan MB, Bartek J. Cell-cycle checkpoints and cancer. Nature 2004; 432(7015): 316-23. [http://dx.doi.org/10.1038/nature03097] [PMID: 15549093] ]. This anomaly is accompanied by morphological and mechanoelastic changes [81Shi M, Shtraizent N, Polotskaia A, Bargonetti J, Matsui H. Impedimetric detection of mutant p53 biomarker-driven metastatic breast cancers under hyposmotic pressure. PLoS One 2014; 9(6): e99351. 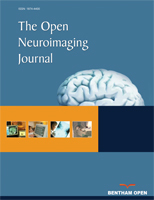 [http://dx.doi.org/10.1371/journal.pone.0099351] [PMID: 24937470] ]. This has triggered a vivid interest in discerning biomechanical properties using TRSAM [47Weiss EC, Anastasiadis P, Pilarczyk G, Lemor RM, Zinin PV. Mechanical properties of single cells by high-frequency time-resolved acoustic microscopy. IEEE Trans Ultrason Ferroelectr Freq Control 2007; 54(11): 2257-71. [http://dx.doi.org/10.1109/TUFFC.2007.530] [PMID: 18051160] , 82Strohm E, Czarnota GJ, Kolios MC. Quantitative measurements of apoptotic cell properties using acoustic microscopy. IEEE Trans Ultrason Ferroelectr Freq Control 2010; 57(10): 2293-304. [http://dx.doi.org/10.1109/TUFFC.2010.1690] [PMID: 20889417] ]. HeLa cells [83Schneider-Gädicke A, Schwarz E. Different human cervical carcinoma cell lines show similar transcription patterns of human papillomavirus type 18 early genes. EMBO J 1986; 5(9): 2285-92. [http://dx.doi.org/10.1002/j.1460-2075.1986.tb04496.x] [PMID: 3023067] ] were studied using TRSAM for the determination of mechanoelastic properties (e.g., cell thickness, density, attenuation, sound of speed, acoustic impedance) under in vitro conditions [84Weiss EC, Anastasiadis P, Pilarczyk G, Lemor RM, Zinin PV. Mechanical properties of single cells by high-frequency time-resolved acoustic microscopy. IEEE Trans Ultrason Ferroelectr Freq Control 2007; 54(11): 2257-71. [http://dx.doi.org/10.1109/TUFFC.2007.530] [PMID: 18051160] ]. TRSAM on HeLa cells yielded an ultrasound velocity of 1534 m/s ± 33 m/s [47Weiss EC, Anastasiadis P, Pilarczyk G, Lemor RM, Zinin PV. Mechanical properties of single cells by high-frequency time-resolved acoustic microscopy. IEEE Trans Ultrason Ferroelectr Freq Control 2007; 54(11): 2257-71. [http://dx.doi.org/10.1109/TUFFC.2007.530] [PMID: 18051160] , 85Zinin PV, Anastasiadis P, Weiss EC, Lemor RM, Eds. Variation of the Sound Attenuation Inside HeLa Cells During Cell Division Using High-Frequency Time-Resolved Acoustic Microscope. 2007 IEEE Ultrasonics Symposium Proceedings 2007; 2007.2007. [http://dx.doi.org/10.1109/ULTSYM.2007.208] ]. Brand et al. estimated the mechanical parameters for viable HeLa cells using a combination of tone-burst excitation with a numerical deconvolution technique [86Brand S, Grube N, Raum K, Strohm EM, Kolios MC. Signal analysis for the estimation of mechanical parameters of viable cells using GHz-acoustic microscopy 2009; 2251.] instead of the short broadband pulses applied in the TRSAM approach [87Strohm EM, Pasternak M, Mercado M, Rui M, Kolios MC, Czarnota GJ. A comparison of cellular ultrasonic properties during apoptosis and mitosis using acoustic microscopy. 2010. IEEE Int Ultrason Symp 2010; 2010: 11-4.]. Brand et al. demonstrated the possibility of combining SAM with deconvolution for the assessment of mechanical and elastic cell parameters. Furthermore, Strohm and Kolios combined TRSAM with the V(z) curve at a frequency of 1 GHz to determine the mechanoelastic properties of viable MCF-7 breast cancer cells [82Strohm E, Czarnota GJ, Kolios MC. Quantitative measurements of apoptotic cell properties using acoustic microscopy. IEEE Trans Ultrason Ferroelectr Freq Control 2010; 57(10): 2293-304. [http://dx.doi.org/10.1109/TUFFC.2010.1690] [PMID: 20889417] , 87Strohm EM, Pasternak M, Mercado M, Rui M, Kolios MC, Czarnota GJ. A comparison of cellular ultrasonic properties during apoptosis and mitosis using acoustic microscopy. 2010. IEEE Int Ultrason Symp 2010; 2010: 11-4.]. Their findings are summarized in Tables 2 and 3. Cell monolayers of HeLa cells were studied extensively using TRSAM at a center frequency of 860 MHz with regard to changes in acoustic properties during cell division and adhesion. The study was conducted under physiological conditions using an environment chamber (37°C and 5% CO2). Fig. (6A ) shows an acoustic image of HeLa cells taken at a defocus of z = -10 μm. Measurements for determining the sound velocity and attenuation were performed using HeLa cells that were undergoing cell division. Cell (i) (Fig. 6A ) has nearly a spherical shape and is probably at the early mitosis stage, while cells (ii) and (iii) have already completed mitosis. Cells that completed division appear with a darker contrast in Fig. (6A ), indicating that sound attenuation inside these cells is higher than in cells (i) and (iv). 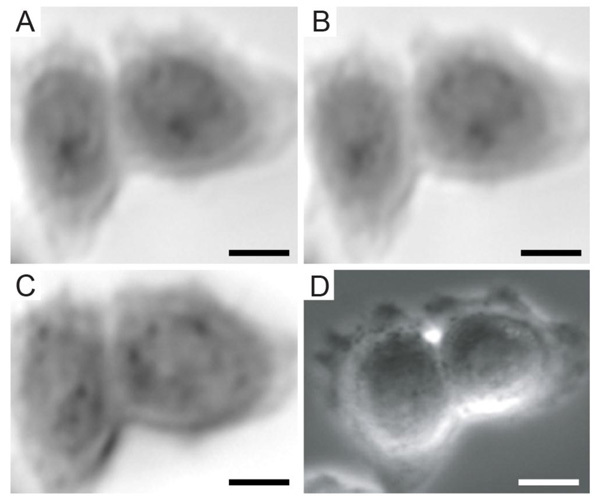 The B-scans of cells (ii) and (iv) are shown in Fig. (6B and C ), respectively. B-scan images of HeLa cells at different stages of the cell cycle show distinct patterns inside the cell. The B-scan of cell (iv) has a characteristic hemispherical shape (Fig. 6C ). In contrast to cell (iv), the B-scan of cell (ii) reveals a strong signal reflected from the rim surface of the cell (Fig. 6C ). Interestingly, the area of strong reflection coincides with the area of increased contrast inside cell (ii). Measurements of the attenuation shown in Table 1 indicate that sound attenuation inside cells increases by a magnitude of approximately 50% after division. Sound velocities of the dividing cells (i, ii and iii) were higher compared to cell (iv) in interphase. C- and B-scans of dividing HeLa cells: (A) C-scan of HeLa cells taken at a defocus of z = 10 µm; (B) B-scan of HeLa cell (ii) from panel “A”; (C) B-scan of HeLa cell (iv) from panel “A”. The scale bars in all panels correspond to 15 µm (Figure from Zinin, Anastasiadis et al. © 2007 IEEE). Quantitative SAM evaluation for thickness, sound velocity, density and attenuation of HeLa cells before and after undergoing division. The acoustic properties vary depending on whether a cell undergoes division or merely is in a resting state (From Zinin, Anastasiadis et al. 2008). The values for cell thickness, ultrasound velocity, density and attenuation of the parent HeLa cell including the respective daughter cells are summarized in Table 1 for the indicated regions of interest (indicated in Fig. 6A ). The RF signals were acquired at a negative defocus of 10 µm below the substrate plane [85Zinin PV, Anastasiadis P, Weiss EC, Lemor RM, Eds. Variation of the Sound Attenuation Inside HeLa Cells During Cell Division Using High-Frequency Time-Resolved Acoustic Microscope. 2007 IEEE Ultrasonics Symposium Proceedings 2007; 2007.2007. [http://dx.doi.org/10.1109/ULTSYM.2007.208] ]. As mentioned earlier, the attenuation values show a significant increase by approximately 50% within the cytoplasm of the daughter cells. The model proposed by Lizzi et al. offers a valid explanation [88Lizzi FL, Astor M, Liu T, Deng C, Coleman DJ, Silverman RH. Ultrasonic spectrum analysis for tissue assays and therapy evaluation. Int J Imaging Syst Technol 1997; 8(1): 3-10. [http://dx.doi.org/10.1002/(SICI)1098-1098(1997)8:1<3::AID-IMA2>3.0.CO;2-E] ]. This model assumes that a random distribution of weak scatterers correlates with a decrease in the effective scatterer size [88Lizzi FL, Astor M, Liu T, Deng C, Coleman DJ, Silverman RH. Ultrasonic spectrum analysis for tissue assays and therapy evaluation. Int J Imaging Syst Technol 1997; 8(1): 3-10. [http://dx.doi.org/10.1002/(SICI)1098-1098(1997)8:1<3::AID-IMA2>3.0.CO;2-E] ]. This can be attributed to the fact that shortly after the completion of mitosis the internal cell structure re-organizes with many structural elements still scattered throughout the cytoplasm. Another explanation could lie with the acoustic attenuation, which is intrinsically elevated at frequencies above 100 MHz. The nuclear condensation while the cell is in interphase and prepares for mitosis, at which point it eventually divides physically into two daughter cells, could be yet another factor contributing to the sharp increase in attenuation [89Kinoshita A, Senda S, Mizushige K, et al. Evaluation of acoustic properties of the live human smooth-muscle cell using scanning acoustic microscopy. Ultrasound Med Biol 1998; 24(9): 1397-405. [http://dx.doi.org/10.1016/S0301-5629(98)00121-5] [PMID: 10385962] ]. It was found that sound velocity in differential cells (1624 m/s) was significantly higher than those in growing cells (1571 m/s) and cells on hypotonic loading (1585 m/s). The increase of attenuation coincided with an increase in the acoustic impedance of the cell. Attenuation increases can be attributed to the polymerization of the F-actin [90Wagner O, Schüler H, Hofmann P, Langer D, Dancker P, Bereiter-Hahn J. Sound attenuation of polymerizing actin reflects supramolecular structures: viscoelastic properties of actin gels modified by cytochalasin D, profilin and alpha-actinin. Biochem J 2001; 355(Pt 3): 771-8. [http://dx.doi.org/10.1042/bj3550771] [PMID: 11311141] , 91Wagner O, Zinke J, Dancker P, Grill W, Bereiter-Hahn J. Viscoelastic properties of f-actin, microtubules, f-actin/alpha-actinin, and f-actin/hexokinase determined in microliter volumes with a novel nondestructive method. Biophys J 1999; 76(5): 2784-96. [http://dx.doi.org/10.1016/S0006-3495(99)77432-1] [PMID: 10233094] ]. These results are in good agreement with observations made by Kinoshita et al. [89Kinoshita A, Senda S, Mizushige K, et al. Evaluation of acoustic properties of the live human smooth-muscle cell using scanning acoustic microscopy. Ultrasound Med Biol 1998; 24(9): 1397-405. [http://dx.doi.org/10.1016/S0301-5629(98)00121-5] [PMID: 10385962] ]. Cell thickness, sound velocity, acoustic impedance, density, attenuation, and the bulk modulus of viable MCF-7 breast cancer cells were the focus of a study by Strohm et al. [82Strohm E, Czarnota GJ, Kolios MC. Quantitative measurements of apoptotic cell properties using acoustic microscopy. IEEE Trans Ultrason Ferroelectr Freq Control 2010; 57(10): 2293-304. [http://dx.doi.org/10.1109/TUFFC.2010.1690] [PMID: 20889417] ]. Acoustic images for the MCF-7 breast cancer cells in interphase and metaphase are shown in Fig. (7 ). A summary of the mechanical properties for MCF-7 cells are shown in Tables 2 and 3 [82Strohm E, Czarnota GJ, Kolios MC. Quantitative measurements of apoptotic cell properties using acoustic microscopy. IEEE Trans Ultrason Ferroelectr Freq Control 2010; 57(10): 2293-304. [http://dx.doi.org/10.1109/TUFFC.2010.1690] [PMID: 20889417] , 87Strohm EM, Pasternak M, Mercado M, Rui M, Kolios MC, Czarnota GJ. A comparison of cellular ultrasonic properties during apoptosis and mitosis using acoustic microscopy. 2010. IEEE Int Ultrason Symp 2010; 2010: 11-4.]. The results show an increase in thickness while the cells transition from the interphase to the metaphase with their respective values changing from 11 µm ± 2 µm to 18.9 µm ± 1.3 µm. The same study by Strohm and Kolios showed that the transition of cells from early to late apoptosis was accompanied by a decrease in thickness from 15.3 µm ± 2.4 µm to 12.5 µm ± 2.1 µm [82Strohm E, Czarnota GJ, Kolios MC. Quantitative measurements of apoptotic cell properties using acoustic microscopy. IEEE Trans Ultrason Ferroelectr Freq Control 2010; 57(10): 2293-304. [http://dx.doi.org/10.1109/TUFFC.2010.1690] [PMID: 20889417] , 87Strohm EM, Pasternak M, Mercado M, Rui M, Kolios MC, Czarnota GJ. A comparison of cellular ultrasonic properties during apoptosis and mitosis using acoustic microscopy. 2010. IEEE Int Ultrason Symp 2010; 2010: 11-4.]. These findings are in agreement with previously reported results for cancer cells undergoing division [85Zinin PV, Anastasiadis P, Weiss EC, Lemor RM, Eds. Variation of the Sound Attenuation Inside HeLa Cells During Cell Division Using High-Frequency Time-Resolved Acoustic Microscope. 2007 IEEE Ultrasonics Symposium Proceedings 2007; 2007.2007. [http://dx.doi.org/10.1109/ULTSYM.2007.208] ]. MCF-7 breast cancer cells investigated by TRSAM at 1 GHz: (A) Backscatter image of an apoptotic MCF-7 cell; (B) attenuation distribution across the cell depicted in panel “A”; (C) optical micrograph of the cell in panels “A” and “B”; (D) a fluorescence micrograph of the same MCF-7 cell shown in the previous panels. Interestingly, the darker area in “B” coincides with the stained nucleus as shown in the fluorescence image. This is characteristic of apoptotic cells as this type of overlap has not been observed with apoptotic MCF-7 cells. The scale bar in all panels corresponds to 15 µm (images are courtesy of Michael Kolios and Eric Strohm, Ryerson University, Toronto, Canada). Quantitative TRSAM evaluation at a center frequency of 1 GHz for thickness, sound velocity, acoustic impedance, density, elastic modulus, and attenuation of MCF-7 breast cancer cells during cell division (From Strohm, Czarnota et al. 2010 and Strohm, Pasternak et al. 2010). Quantitative TRSAM evaluation at a center frequency of 1 GHz for thickness, sound velocity, acoustic impedance, density, elastic modulus, and attenuation of MCF-7 breast cancer cells transitioning from early into late apoptosis (From Strohm, Czarnota et al. 2010 and Strohm, Pasternak et al. 2010). Acoustic and optical images of embryonic chicken heart muscle cells: (A) acoustic image taken at a defocus of z = - 4 µm; (B) acoustic image taken in focus (z = 0); (C) acoustic image at a defocus of z = 4 µm; (D) fluorescence image stained for F-actin. The field of view of the acoustic images is 50×50 µm (Figure from Weiss, Lemor et al. ©2007 Ultrasound in Med. & Biol.). The sound velocity studies for MCF-7 breast cancer cells yielded statistically similar values between interphase and metaphase in the order of 1570 m/s ± 15 m/s and 1567 m/s ± 11 m/s, respectively [85Zinin PV, Anastasiadis P, Weiss EC, Lemor RM, Eds. Variation of the Sound Attenuation Inside HeLa Cells During Cell Division Using High-Frequency Time-Resolved Acoustic Microscope. 2007 IEEE Ultrasonics Symposium Proceedings 2007; 2007.2007. [http://dx.doi.org/10.1109/ULTSYM.2007.208] ]. Density values were statistically similar between interphase and metaphase on the order of 994 kg/m3 ± 13 kg/m3 to 992 kg/m3 ± 9 kg/m3. However, with regard to the bulk modulus, a statistically significant decrease of 0.02 GPa was found between the interphase and metaphase and an increase of 0.02 GPa between interphase and early apoptosis [85Zinin PV, Anastasiadis P, Weiss EC, Lemor RM, Eds. Variation of the Sound Attenuation Inside HeLa Cells During Cell Division Using High-Frequency Time-Resolved Acoustic Microscope. 2007 IEEE Ultrasonics Symposium Proceedings 2007; 2007.2007. [http://dx.doi.org/10.1109/ULTSYM.2007.208] ]. During the transition from interphase into early apoptosis, the MCF-7 cells’ thickness increased from 11.0 µm ± 2.0 µm to 15.3 µm ± 2.4 µm [85Zinin PV, Anastasiadis P, Weiss EC, Lemor RM, Eds. Variation of the Sound Attenuation Inside HeLa Cells During Cell Division Using High-Frequency Time-Resolved Acoustic Microscope. 2007 IEEE Ultrasonics Symposium Proceedings 2007; 2007.2007. [http://dx.doi.org/10.1109/ULTSYM.2007.208] ]. However, an increase in ultrasound velocity was observed between interphase and early apoptosis from 1570 m/s ± 15 m/s to 1588 m/s ± 20 m/s, respectively, followed by a decrease from 1588 m/s ± 20 m/s to 1555 m/s ± 13 m/s when the cells transitioned from early into late apoptosis. A decrease in density was observed between interphase and early apoptosis with the respective values dropping from 994 kg/m3 ± 13 kg/m3 to 979 kg/m3 ± 13 kg/m3. Subsequently, when the cells entered late apoptosis, an increase in density was observed from 979 kg/m3 ± 13 kg/m3 to 988 kg/m3 ± 7 kg/m3. A significantly larger change in the bulk modulus was observed during the cells’ transition from early to late apoptosis on the order of 0.08 GPa [85Zinin PV, Anastasiadis P, Weiss EC, Lemor RM, Eds. Variation of the Sound Attenuation Inside HeLa Cells During Cell Division Using High-Frequency Time-Resolved Acoustic Microscope. 2007 IEEE Ultrasonics Symposium Proceedings 2007; 2007.2007. [http://dx.doi.org/10.1109/ULTSYM.2007.208] ]. Attenuation values increased from 1.44 ± 0.15 dB/cm/MHz to 2.00 ± 0.45 dB/cm/MHz between interphase and early apoptosis and subsequently decreased from 2.00 ± 0.45 dB/cm/MHz to 1.40 ± 0.64 dB/cm/MHz at later stages of apoptosis [85Zinin PV, Anastasiadis P, Weiss EC, Lemor RM, Eds. Variation of the Sound Attenuation Inside HeLa Cells During Cell Division Using High-Frequency Time-Resolved Acoustic Microscope. 2007 IEEE Ultrasonics Symposium Proceedings 2007; 2007.2007. [http://dx.doi.org/10.1109/ULTSYM.2007.208] ]. TRSAM allows for the investigation of elastic and mechanical properties of cells and tissues. Adding the optical and fluorescence component facilitates the correlation of acoustic information with biologically relevant fluorescent markers associated with molecular targets. The arrival times and amplitudes of the echoes originating from the sample and the interface allow for the determination of the local acoustic impedance of cells or tissues. Cells have been modeled as a thin liquid layer on a substrate with spatial variations of elastic properties. TRSAM has been used for quantitative measurements of mechanoelastic properties at a cell and tissue level. Furthermore, quantitative measurements of the elastic properties of cells in combination with spatiotemporal observation of dynamical cell processes offer enormous potential for characterizing and understanding underlying molecular cues in conjunction with biomechanical properties. Comparison between the acoustic and fluorescence images of chicken heart muscle cells demonstrated overlap of the actin fibers with the dark bundles that could be seen in the acoustic images indicating that actin fibers can be recognized using TRSAM at ultra high-frequencies. Imaging of focal adhesions in living cells without immunohistological staining is of paramount importance for a wide range of cell biology studies as it provides a tool for investigating spatiotemporal changes in cell locomotion, migration and adhesion. There is undoubtedly a necessity to determine biophysical features of cells and tissues in a non-nvasive and non-destructive manner. Higher frequencies allow for improved resolution at the expense of penetration depth compared to lower frequencies that facilitate increased penetration depths at the expense of resolution. TRSAM offers a wide range of operating frequencies depending on the requirements determined by the physical dimensions of the samples that need to be characterized. Biomechanical forces modulate the behavior of cells during intravasation into and extravasation from the vascular system. The emerging recognition of the role of physicomechanical processes in cancer metastasis necessitates the development of novel strategies for bridging the gap toward understanding the interaction between mechanical and biochemical quantities. TRSAM facilitated elastography can contribute toward a more holistic approach that combines biochemical insights with biophysical characteristics. High-frequency ultrasound biomicroscopy and elastography has followed an exciting path thus far bringing together many different fields in basic sciences. The field is marked by a fast-paced development of novel techniques with the potential to translate findings into more efficacious treatment approaches. The authors would like to acknowledge Michael Kolios and Eric Strohm from the Ryerson University, Toronto, Canada for providing data used in this review article. We would also like to thank Frank Schubert from Fraunhofer IKTS, Dresden, Germany for providing simulation data and intellectual input. Fung YC. Biomechanics Mechanical Properties of Living Tissues 1993; 569. Evans EA, Skalak R. Mechanics and Thermodynamics of Biomembranes Florida 1980. Ananthakrishnan R, Guck J, Wottawah F, Schinkinger S, Lincoln B, Romeyke M, et al. Modelling the structural response of an eukaryotic cell in the optical stretcher. Curr Sci 2005; 88(9): 1434-40. Guck J, Chiang JA, Kas J. The optical stretcher a novel tool to characterize the cytoskeleton Molecular Biology of the Cell 1998. Wang J, Gundle R, Briggs GAD. The measurement of acoustic properties of living human cells. Trans R Microsc Soc 1990; 1: 91-4. Briggs A. Acoustic Microscopy 1992. Zinin PV, Weise W. Theory and Applications of Acoustic Microscopy.Ultrasonic Nondestructive Evaluation: Engineering and Biological Material Characterization 2004; 654-724. Zinin PV. Quantitative acoustic microscopy.Experimental Methods in the Physical Sciences 39 2001; 135-87. Hildebrand JA, Rugar D, Johnston RN, Quate CF. Acoustic microscopy of living cells. Proceedings of the National Academy of Sciences of the United States of America 1981; 1656-60. Briggs A. An Introduction to Scanning Acoustic Microscopy 1985. Lempriere BM. Ultrasound and Elastic waves Frequently Asked Questions Amsterdam 2002. Zinin PV, Weise W. Theory and applications of acoustic microscopy.Ultrasonic Nondestructive Evaluation: Engineering and Biological Material Characterization 2003; 654-724. Schubert F, Koehler B, Zinin P. Numerical time-domain simulation of wave propagation and scattering in acoustic microscopy for subsurface defect characterization 2005. Schubert F, Koehler B, Zinin P, Eds. Numerical time-domain simulation of wave propagation and scattering in acoustic microscopy for subsurface defect characterization Nondestructive Evaluation for Health Monitoring and Diagnostics 2005. Stamnes JJ. Waves in Focal Region. Adam Hilger 1986. Zinin P, Weise W, Lobkis O, Kolosov O, Boseck S. Fourier optics analysis of spherical-particles image-formation in reflection acoustic microscopy. Optik (Stuttg) 1994; 98(2): 45-60. Zinin PV. Quantitative Acoustic Microscopy.Modern Acoustical Techniques for the Measurement of Mechanical Properties Experimental Methods in the Physical Sciences 39 2001; 135-87. Sajio Y. Clinical Applications of Ultrasonic Nondestructive Evaluation.Ultrasonic Nondestructive Evaluation: Engineering and Biological Material Characterization 2004; 783-812. Brand S, Grube N, Raum K, Strohm EM, Kolios MC. Signal analysis for the estimation of mechanical parameters of viable cells using GHz-acoustic microscopy 2009; 2251. Strohm EM, Pasternak M, Mercado M, Rui M, Kolios MC, Czarnota GJ. A comparison of cellular ultrasonic properties during apoptosis and mitosis using acoustic microscopy. 2010. IEEE Int Ultrason Symp 2010; 2010: 11-4.